BTW, to get a baseball bat (not nancer's flying rat) shape in Photoshop I set a vertical guide, drew a path that looked like a bat cut in half, duplicated the path, flipped the duplicated path horizontally, moved the path back to center. From there I CTRL-Click'd on both paths to create a selection and filled it with black. After that it was all Rey's tut and some trial-and-error. 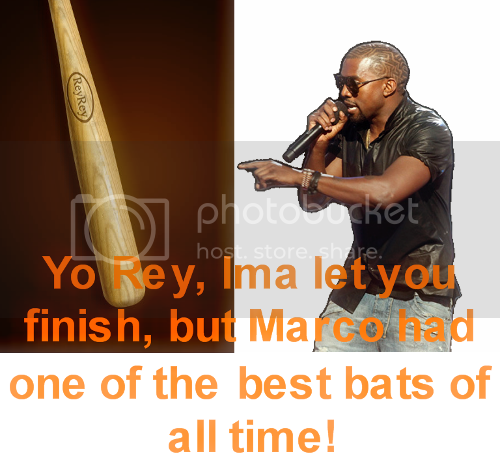 And someone else make a fake bat too! Probably what Rey did! He just left that part out! OK, here is my fake baseball bat. I created it in my trusted old Adobe, nothing fancy. But I think it went well. If'n it would help get this to the tuts I'll volunteer to HTML-ize it. it is a good wood tut! maybe it should be published here. I WILL NOT FIX THE BAAAAAAAAAT!